Poetic, intimate and moving at times, this is a good book. However, the novel is well-written on certain levels and lacks depth on others. I couldn’t really rate it that highly. 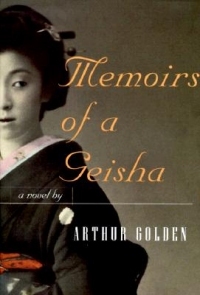 Golden has considered tailoring his prose to the lips of a woman, a Japanese woman, a woman unique among Japanese women. The similes and metaphors that he places in the mouth of Sayuri work well and you can imagine her saying them. Check out the closing line, for example. This he does very well and I can’t fault him for style. I, however, enjoyed the novel more for its reconstruction and images of Japan than the plot or literary style. Having lived in Japan for 6 years and picked up a lot of culture and history, it was nice to have a new perspective on a fascinating era in the nation’s history as the country blundered its way blindly through the imperialism of the 30s and out into the modern era. But the romantic element was stretched a bit far I thought and entirely predictable as very few popular US authors I’ve read (screenplay writers also) leave you with a tragic twist. This detracted from anything the novel could really have said about the real lives of real geisha. What happened to Sayuri simply doesn’t happen to the majority of Geisha. For example, one of my old students in Japan told me, after reading this, that something very similar had happened to her grandmother. She’d been sold from a fishing village to, not Kyoto, but Osaka as a geisha. She’d had a miserable apprenticeship just as Chiyo/Sayuri did. But that’s where the similarities stopped; she also had a miserable life. I wonder if Golden is just reinforcing the western idyll of geisha in elaborating Sayuri’s professional life as he did. And the novel disappoints in the one area it could have shone. There are untold opportunities here to do more than just give some historical perspective on the treatment of women. The book would have been important literature if it had used this to provide commentary on that issue. After reading Garp a couple of books ago, I realise just how well Irving approached this topic and wove it into his novel. Golden missed a golden opportunity perhaps. So, interesting but nothing too surprising here. One evening in the spring of 1946 when I was a boy of 14, my father took me to a dance performance in Kyoto. I too was somewhat dissapointed. I had such a great expectation, particularly appreciating how Golden COULD have taken us with this story. On your rating scale, I would place this just a “OKAY”.